by Brianna Crandall — March 29, 2019 — Greenheck, a US-based manufacturer and distributor of air movement, conditioning and control equipment around the world, has expanded its line of Dedicated Outdoor Air Systems (DOAS) for high percentage and 100% outside air. 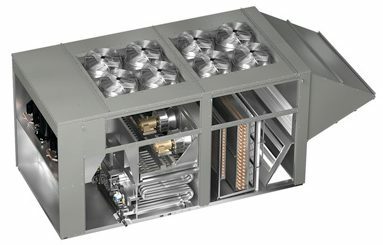 The new pre-engineered rooftop ventilator models RV-110 and RVE-180 with energy recovery provide capacities up to 18,000 cfm, up to 70 tons of open packaged cooling and 1200 mbh indirect gas-fired heating. The new units are ideal for 100% outdoor air, variable air volume and single-zone applications. Greenheck explains a dedicated outdoor air system (DOAS) as being a unit supplying cooled, dehumidified outside air to the building in summer and heated outside air in the winter. The system can also include a total energy wheel, which offers up to 80% total effectiveness, reducing the heating and cooling capacity requirement of the DOAS unit significantly. The new RVE model features an energy recovery wheel for superior energy savings. Both rooftop ventilator models feature an upgraded controls platform for efficient operation, with a web user interface (UI) that comes as standard. The new web user interface provides an overview graphic of the unit operation and allows the controller menus to be accessed and adjusted from the web UI. The factory-programmed, wired and tested controller can operate as a stand-alone unit or integrate with a building management system (BMS), and is designed to be easily configured in the field. Factory-mounted variable frequency drives on models RV-110 and RVE-180 control air flow. A digital scroll compressor provides tight temperature and humidity control, and a 10:1 high turndown furnace provides precise temperature control. All are standard features with packaged DX cooling and indirect-gas heating on these new models. Featuring two-inch double-wall construction and R13 thermally broken foam insulation, Greenheck DOAS units meet the demands of today’s heating, cooling, dehumidification, and ventilation requirements, says Greenheck. For more information about Greenheck’s Dedicated Outdoor Air Systems and other ventilation products, visit the company’s website. Did you know how much sub-compliant indoor air quality cuts productivity? January 23, 2019 In "Surveys and Trends"
Looking for reliable hot water and reduced energy costs? This partnership is expanding combined heat and power (CHP) options in North America May 7, 2018 In "Products and Services » HVAC/IAQ"
Establishing good ventilation February 16, 2019 In "How To » BOMI International"
If you need an easy drop-in HVAC retrofit, check out this unit ventilator with more efficiency, less operating noise December 21, 2018 In "Products and Services » HVAC/IAQ"
Find out how Boyd’s acquisition of Airflow Systems will reduce noise and vibration for advanced air mover applications January 25, 2019 In "Developments » Corporate and Organization"